Now that we have talked about Callaway Headcovers, we felt compelled to also include headcovers from one of the worlds leading brands. This next brand has made the cover of numerous worldwide magazines due to their expertise, their leading products, and has been worn by my industry professionals for years. With that, they actually have some of the world’s most expensive clubs. Their clubs are designed meticulously for quality and they have been known to be used by tour professionals for years. So, how do you protect these award-winning clubs? Well, this is where this article comes in. TaylorMade has long been known for producing expert quality products. With much of their attention to detail and quality craftsmanship going towards industry-leading clubs and designs that are unique and use the most modern of technology. With that said, it is important to also cover the head of your club when in transit, and you do this with a quality headcover. 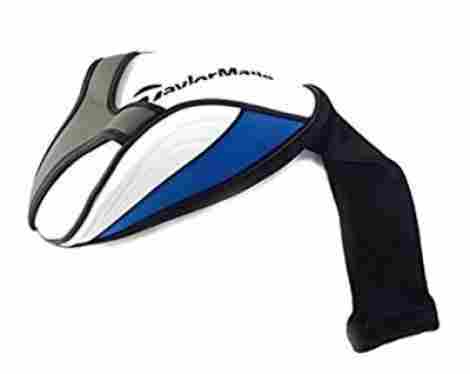 We are eager to share with our audience the top ten best TaylorMade headcovers. These headcovers are designed to be unique, different, and offer protection for individuals that want a quality product that is designed to excel. Most importantly, these kind of equipment are all very stylish, aesthetically pleasing, and are highly durable. So, you can add this next ‘must-have’ to your Travel Gear list for when you want to protect your clubs. Before we begin, here are a couple of quick benefits of buying and using a club headcover. Protects your clubs when you are traveling. Protects your clubs from rain or moisture. Protects the clubs from dust. Protect the clubs when stored away. With that said, let’s talk about product number one on our list! As the first headcover on our list, we want to share a product that is expertly designed to offer maximum protection to your clubs. 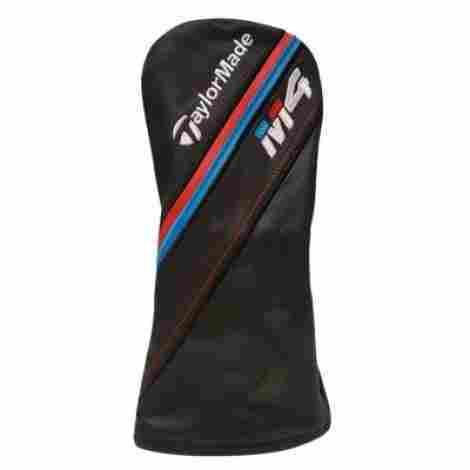 Designed for specific clubs, we want to share the TaylorMade M4 Headcover 2018 Fairway. With a unique design, contract stitching, and expertly designed look, this is one sporty headcover that turns heads on the golf course. Here are two benefits! This specific product has a very unique soft and padded lining design that adds an additional layer of protection. Overall, the lining offers extra protection to the clubs, adding to the overall value of this specific item if you want padding and protection. With that in mind, individuals can expect the lining to be durable and protect during transit, minimizing wear and tear on the club head. This product comes with an elastic band design that is integrated to ensure a snug fit and a secure hold. With this, the elastic band offers excellent craftsmanship and added protection to the individual using the product. With this in mind, the band makes the product easy to put on and protect the club head from any wear and tear. To discuss cost and value for this headcover, we see this as a great addition to any club set and individual that wants a quality product that is designed to succeed. Overall, the soft padded lining and added protection only add to the value. For the price, it is well designed and guaranteed to last. This product is five stars throughout. As product number two, we want to share a fairway wood headcover that is designed to be extremely sporty. This product has a stylish yellow and black finish with white contrast stitching that makes it sporty and dynamic in design. If you want a product that will stand out among your many other headcovers and clubs, we recommend this one. Let’s talk features. This product is made with a quality synthetic leather finish. The finish is designed to be high quality, water-resistant, and even includes perforations for breathability. Overall, the synthetic leather material feels very high quality and expensive, making the overall product design highly durable as well. As is common with synthetic leather, it cannot be washed but it can easily be wiped down. This product comes with quality shaft protection. 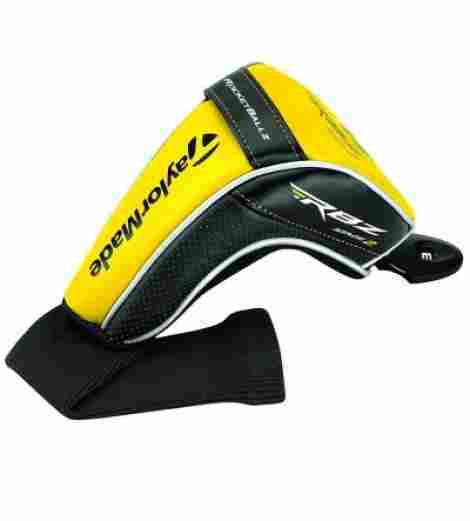 The shaft sock liner is designed to protect the connection of the fairway wood and the shaft alongside providing excellent protection to the shaft as well. Overall, this product is very high quality and simple in the design and individuals can expect it to be durable and not wear and tear easily. As far as the value and the price for this item, we see this product is being quiet durable and high quality. Of course, many products from this brand are of the highest quality and material design. With that, this fairway headcover is worth it if you like the style and trust this brand’s dynamic quality. Overall, it is a bit costly, but it has great reviews touting the quality of the design. Leather material is very smooth. As the next headcover, we want to share a quality headcover that is made to be of a high quality material and expertly crafted for shaft protection as well. 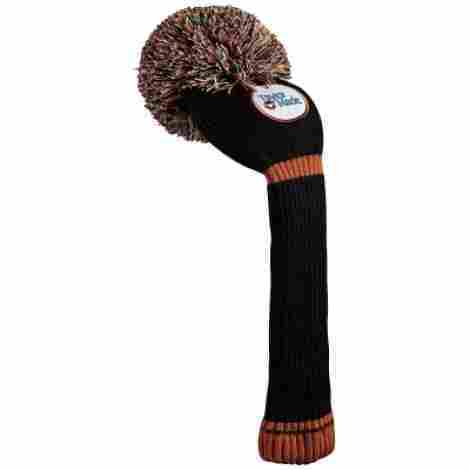 This product is a durable headcover that is designed to be longer than others and offer maximum protection. Alongside this, it has a fun and unique POM design that makes it stand out. Here are two features. This product is designed from a highly durable material. Essentially, this product acts as a sock for the club, enhancing the longevity and lifespan of the club by protecting it from wear and tear. With that, the sock is made of polyester, which happens to cushion the club head very well from other club heads in the club set. Alongside this, the product is ribbed and is very easy to place on the club. This product happens to be semi-perforated. Essentially, the club will not build up any moisture because the design of the sock is designed to be made to be breathable and moisture wicking. Adding to this, the protection is still of the best quality because this product even has a reinforced lining to minimize overstretching when placing it on the club and taking it off. To discuss cost and value, we want to share that this product is made to be durable and beneficial. For individuals that want a fun and unique design that stands out among other club heads, this it it. With that, the benefits of this include the reinforced lining, shaft protection, quality POM, and breathable factor of the product. For the price, it is a great deal. This next headcover is designed for durability and functionality and happens to be made of one of the highest quality materials in the industry. This item is made of TaylorMade quality and we can guarantee our audience will find tremendous benefit from the club headcover. 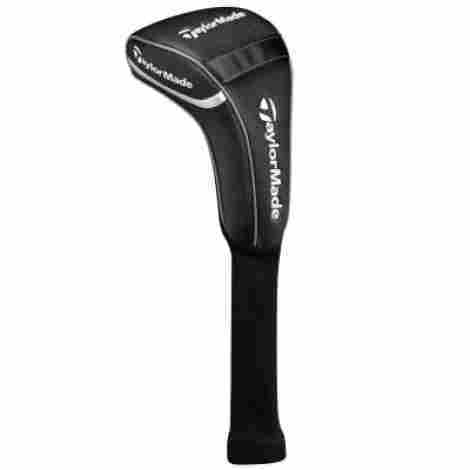 Here are two benefits of the TaylorMade Golf 2018 Golf Club Headcover and the specific design of this driver cover. This product comes from a quality leather material. The leather material is extended to all aspects of the cover and the stitching is of the best possible material design. With that, the cover is expertly crafted to be easy to clean and very durable. More so, the fact that it is leather makes it water-resistant and moisture-wicking, adding to the overall protection that the club will have. This is the 2017 headcover and it comes in four different styles. That is one great aspect about this brand that we can appreciate. This cover comes in four different styles ranging from driver, fairway, putter, and rescue and individuals can expect all of them to have many of the qualities that make this product an excellent item. To discuss cost and benefits, we see this cover as a durable addition to any club set. Overall, this product is easy to place on the club, offers great protection, and even has plenty of positive reviews. Most importantly, the style is highly attractive and appealing, further adding to the quality of the product. With 4.5 stars, this is a great addition to any club set. The price is a bit high for the quality. As product number five on our list, we want to share the TaylorMade Aero Burner Hybrid, a great addition to a club set alongside a quality design that is very durable. This product is made to be very durable, easy to place on the club head, while also adding to the quality of the set and enhancing the overall look. During travel, this is a great item to have. As one would expect from this brand and products such as this, this item has excellent stitching. The stitching is expertly designed to be of the best quality design. With that, the stitching also enhances the overall look of the item alongside the material design. This product is a five-star headcover. With this, many individuals have touted the appearance as being a perfect fit. With that, the appearance of the headcover is very stylish and individuals can expect it to fit on the club head very well. To discuss cost and value, we think this product is of the best quality design for the price. The style, most importantly, is highly appealing and quality made. It stands out, it looks great, the stitching is quality made, and the protection on the club head enhances the overall look. With this, if you love the style, it is worth it. As product number six on our list, this one is particularly, more unique than others. This next headcover is the headcover for the particular spider series. 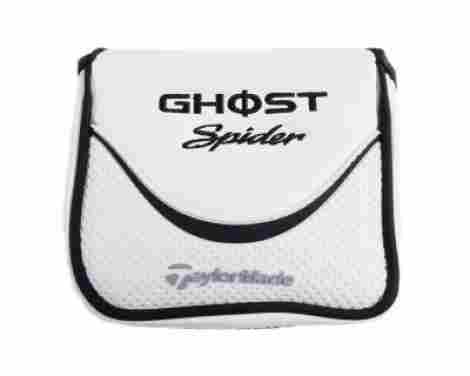 This is the TaylorMade Ghost Spider HeadCover and here are two features to consider about this product. This product has a magnetic closure design. With that, individuals can expect the item durability to be of the best design quality. More so, the overall value is in the fact that it is simple to put on and take off. However, it still protects the Spider putter from potential wear and tears during transit or while being stored. The material design of this product is of the best quality and individuals can expect it to be very durable. This product comes with quality synthetic leather to add to the value design and the material. With that, the stitching is also of the best quality design and individuals can expect the stitching to also add to the value of the product. As far as cost and value for this unique product, we see this as a durable addition to any club set and most importantly, it protects the Spider putter, which is highly expensive. With that, since this product is so particular, it actually is a bit more pricey than other putters, but it is worth it. It is easy to clean, it is shafted, and it’s very high quality. This next product happens to be a very high-quality headcover made from a quality material and designed to last. 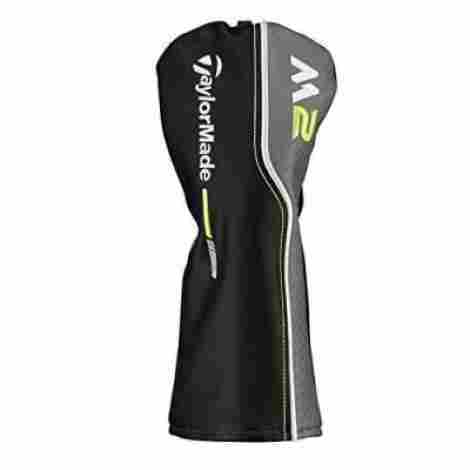 The TaylorMade New 2017 M2 HeadCover is quality designed for durability and easy placement on the club head. The overall design fits very snug and has a secure hold so it does not fall off. If you are considering a quality item, this is it. Here are two features to consider this product. This product has a unique contrast stitching design that makes the product even more stealthy and sporty looking. The overall color choice is a black and gray design with lime accents. With this, the stitching is lime-colored and designed to stand out. Overall, individuals will appreciate the color choice because it matches with everything. The overall lining of this product is a padded and soft design that makes the overall product of the best quality design and ensured to offer maximum protection. With this, the protection is made to be durable and comfortable and designed to last. The soft padded lining contours the design of the fairway wood and individuals can expect to have a great fit. As far as price, benefits, and value, we see this headcover as a great addition to any individual that wants an expert quality product. Made to last, the overall design is simple to place on the club head, offers excellent padding, will not break easily, and offers a water-resistant finish. The leather material is also easy to clean and very stylish looking. Soft padded lining for additional protection. Individuals have mentioned that it fits odd. This next cover is known as a quality product, with 4.5 stars, and a design that makes it sporty and modern. With white, grey, and blue accents, individuals can expect the design of this product to be well made and designed to last. We want to share with our audience the New TaylorMade Universal SLDR jetSpeed Driver Golf Headcover and two features of this product. This product is made with a quality shaft protection design that guarantees maximum durability and quality. Overall, the shaft protection is elastic and is easy to place on the club. However, the main benefit is the fact that the driver will have quality protection in the area where the shaft connects to the head of the club. The material of this product is a durable quality construction material that is designed for durability and quality. The material is guaranteed to last and offers individuals a trustworthy product where no corners are cut and even the stitching is of superb quality. With this, the stitching is seamlessly designed into the design, making the product clean cut and durable. To discuss cost and value for this product, we see this quality driver cover designed to be easy to use and offer protection to clubs when in transit. 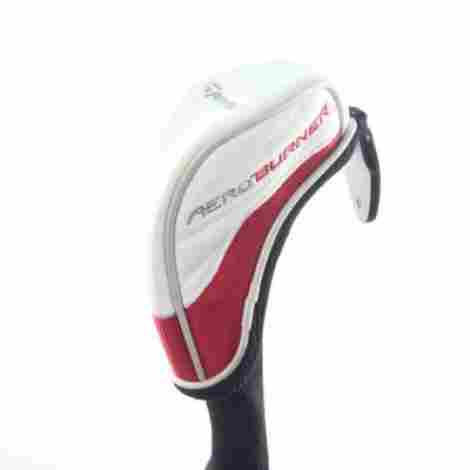 With this, the headcover is made to be durable, lightweight, and offers protection to the club head. The shaft protection is a great addition to the cover and individuals can expect the shaft protection to be as high quality as the main core. For the price, it is worth it if you like the style. Quality design that is easy to place on the cover. Trusted brand with excellent customer service. Stylish and modern color choice. As the ninth product on our list, we want to share a stylish and frankly, beautiful headcover. The color design of this product is different than most from this brand, ranging into a lighter color scheme. In fact, this product is mostly white and light grey with a tint of teal. Overall, the design is very simple and has quality protection benefits for the driver. Here are two aspects to consider. This product has an elastic band design that allows for it to conveniently protect the head of the driver really well. The elastic band is of the highest material quality and overall is designed to offer a snug fit protection that ensures the club head will be well covered and protected. With this, we recommend this design for individuals that want a durable quality material finish. This product is made with a quality stitching design that is seamlessly designed into the material quality of the product. With this, the stitching is built to add years of longevity and durability to the product as well as an overall quality overview of design quality and benefits. If you want a quality product and are considering a great driver, we recommend this item. As far as price, this product happens to be one of the least expensive. Maybe it is because it has no reviews and it has a simple design. However, the simple design is what makes it even more elegant and appealing to the driver. For the price, it is worth considering due to the low price. Quality design that is durable. White and grey color tone is elegant. Easy to put on headcover. Elastic band design for snug fit. This product may be one of the highest quality designs. Although it comes from the 2015 addition, it is still worth considering. First, it comes in three different styles for individuals to choose from and it even comes in two color tones as well. 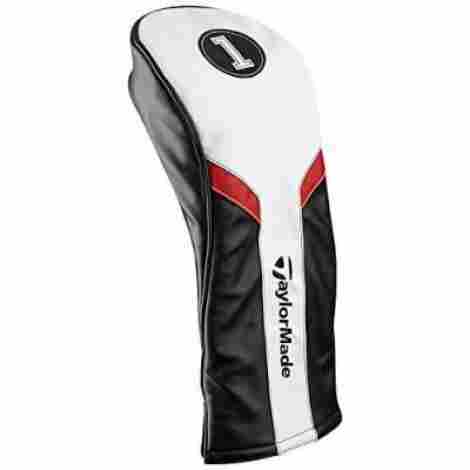 With a great design and easy to place functionality, we want to share the TaylorMade 2015 Universal Golf Club Cover and two features of this product individuals can look forward to. The benefits of perforations are without question, plenty! The reason being is that perforations allow for more durability and longevity when it comes to the product. By being perforated, no moisture can build up in the cover, which can eventually lead to damage to the cover and the shaft. With this, the head of the product is made from a synthetic PU leather that is durable and built to last. As we said, this product is of one of the highest material qualities and design. Overall, this product also includes a polyester sock bottom attached to the constructed and well-designed synthetic PU leather. With this, the sock is very durable an designed to offer excellent protection to the shaft. Overall, the design is also a slip-on design that guarantees quality and protection. To discuss cost and value for this item, it is important to consider the overall design of the product. The reason being is that it does come in different sizes and two color choices. Therefore, the price will vary depending on the product. With that, individuals can expect this item to be of the best material quality design and overall it has a modern fit that looks very stylish. Can be difficult to put on due to tightness. Now that we have shared the top ten headcovers from this leading brand, we want to hear your thoughts. If you are looking for a quality headcover, which of these would you choose? Now, it’s improtant that, before you purchase a product, you take the time to figure out what aspects are important to you. With this said, we want to move forward and share with our audience the criteria to evaluate the best headcovers. This criterion helped us identify the best covers of this brand. As the criteria to evaluate the best headcovers, our primary intention is to share with our audience the unique way in which to pick out the best cover for you. With that, it is important to follow a strict set of guidelines or criteria to ensure you are picking out the best item for you. Also, the criteria serve as general knowledge to help our audience identify the different areas to look into when selecting a headcover. So, without further wait, let’s discuss the criteria to evaluate the best headcovers by TaylorMade. As the first criteria on our list that we took into consideration, we found that reviews and quality was an important factor in selecting the best product. The reason being is that it helped us identify which products were of the best quality design and overall value. Alongside this, to identify the best products we wanted to only select a variety of items that were above the four-star marker. With that, we want to share with our audience a checklist of what to look out for when reading reviews from the individuals. The overall durability of the product. The customer service of the brand. If the item comes as described. If the product is new. If the product is well-packaged. If the item fits the way it is intended. With this in mind, these are only a couple of important aspects to consider. We now want to move forward to the meat and potatoes of selecting the best quality headcover from this brand. The overall material quality and design of a product will make headway for durability and the way it aesthetically looks. With that, there are various material qualities when selecting a quality headcover. The reason being is that there are many different designs for different types of clubs. So, we want to share with our audience two of the most common materials that a headcover can be made from. Polyester happens to be the most common material. This material quality guarantees an overall great value for the price and overall is designed to be more durable and affordable. With that, polyester has different features to look out for ranging from breathability to durability and elasticity. Now, polyester sometimes may be added into a specific area of the cover such as the shaft, for shaft protection. When taking into consideration this material, look out for the design, the overall craftsmanship, durability, and how elastic the item is to guarantee it is a great fit. The downfall of this material is that if it is not of the best material quality, the elasticity may go down from time to time. This material quality is one of the most common and also one of the most durable. Leather created by many of these brands for the intention of protection is designed to be aesthetically pleasing, but it is also synthetic to ensure maximum protection and durability without the hefty price of real leather. With that in mind, the many different benefits of leather range from easy to clean, to more durable, more comfortable to use, and also happens to cushion and protect the head of the club more easily and effortlessly. With that, leather synthetic leather can scratch easily. Now, when picking out the best material for your club, we want to share different design elements to look out for that will cause the design of the product to vary as far as design and overall benefits. You always want to look for the quality of the stitching. Polyester will have more of a sock-like fit. However, you want to guarantee that the polyester sock material and design will not snag easily and that the elasticity design is of the best material value. With this in mind, stitching is an important aspect to look out for in leather covers because you want to make sure that the stitching will not come undone. The fit of the product is also another important factor to look out for. The reason being is that you want to select the best fit for your club. There are numerous cover designs to consider ranging from drivers to putters. So, always select the cover that is particular to that club. With that, consider the fit difference between a contoured leather cover and a sock-like cover that goes over the design of the product. The closing of the cover is another important factor. Most socks have an elastic closing design, while leather covers have a Velcro strap or sometimes a magnetic closure. With this in mind, the closing design is an important factor because it guarantees that the product will be well protected. When picking out the best quality cover, consider the cushioning of the product. Some covers have no cushion at all, while other covers do have a cushioning in the interior of the headcover to guarantee maximum safety when using the product. With that said, socks tend to have little to no cushioning and they act more as a protecting agent against dust and rain. Another aspect of the design to consider is the breathability. The reason being is that a cover that is not breathable may cause specific areas of the club to rust. With that in mind, many leather covers have perforations and the polyester socks are designed to be maximum breathability as well. As the last design element to consider, shaft protection is an important element to take into consideration. The reason being is that many covers will offer shaft protection and some will not. However, the biggest benefit is that it protects the connection of the shaft to the head and ensures no wear and tear in that area. With this in mind, we want to share with our audience another criterion to take into consideration. This kind of equipment tend to cost around the same range for the same material design. With that said, it is important to consider that leather covers will cost more than polyester. Another important aspect to ask yourself is whether or not you want a set of headcovers or one cover for one club. With that, the prices tend to be the same through the market. However, individuals can expect premium brands such as this to have higher prices due to their material and quality designs. Now, let’s move forward and answer some of the most common questions of a headcover. Q: Is the cover machine washable? A: This truly depends on the material quality of the product. Most polyester sock-like covers are machine washable. However, if they are designed with a POM they may start with wear and tear in the wash.
Q: How do I know which cover to pick? A: Most covers are specifically designed for particular clubs. Therefore, consider the type of club you want to cover such as a driver or a putter and pick a cover that is fitted for that club. Q: What if the cover does not fit? A: Well, first examine what type of cover it is because it may be the wrong design or size for the product. With that said, if the cover does not fit, many brands will have a return window period. Q: Is the cover water-resistant? A: Most covers are not water resistant. With that, it is important to consider that some may be able to wick away drops of water such as synthetic leather. But, most are not fully water-resistant.